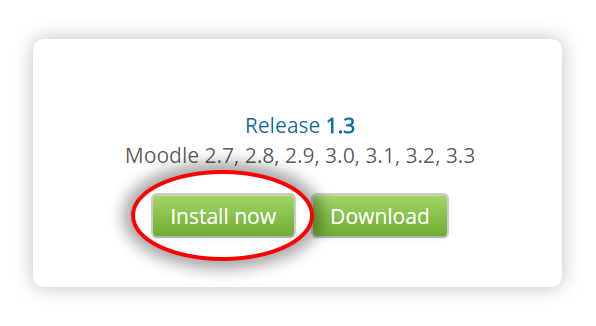 Skip this step if you already have a functional Moodle installation. Follow the usual installation instructions. 1. Log in to your Moodle installation as an administrator. Under Site Administration, Plugins in the admin menu, press Install plugins and then the button labelled Install plugins from the Moodle plugins directory. 2. At this point, you may have to log into your moodle.org account. Locate the H5P plugin page and press the button labelled Install now. 3. On the next screen, press the Install now link located next to the site ON WHICH you wish to install H5P. 4. You will now be redirected back to your site, confirm the installation by pressing Continue. 5. Review the install log and check for any error messages. Press Continue again. 7. You should now be greeted by a message from the H5P plugin. Please take note if the content types were automatically installed, if not you will need to go through the next section, Uploading and creating content. Press Continue when you are ready to move on. 8. Verify the H5P Settings and press Save changes. The default settings should be fine for most sites. That's it! If everything went smooth, you should now be ready to start creating H5P activities in your courses. Press "Add an activity or resource." Select H5P - "Interactive Content" and click "Add". Download the plugin from the H5P page. Visit Site administration -> Plugins -> Install plugins page (/admin/tool/installaddon/index.php). 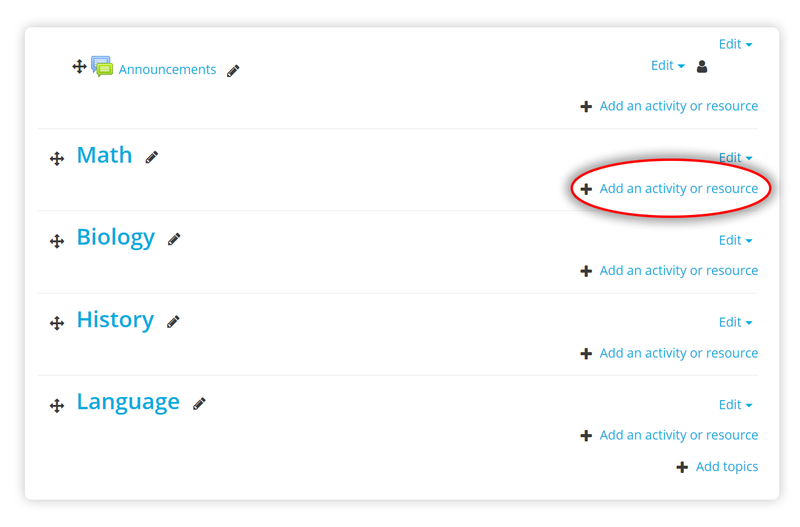 Select the Activity module (mod) as the Plugin type. Select the downloaded plugin file(zip), read and check the Acknowledgement box. Press the Install plugin from the Zip file button. Follow the process. 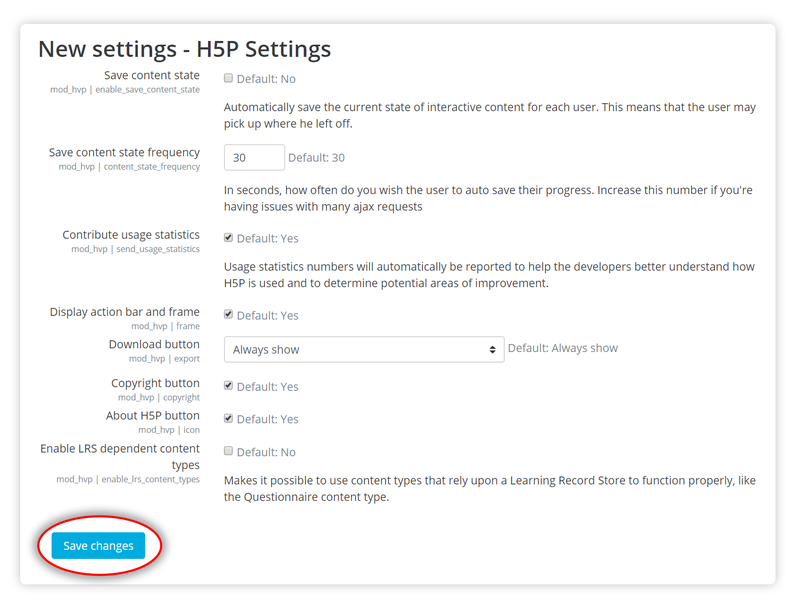 Upgrade the database and afterwards, review and save the H5P settings page. If you find any bugs or issues, please report them. Let us know what you think of the plugin or if you have any suggestions for improvement. 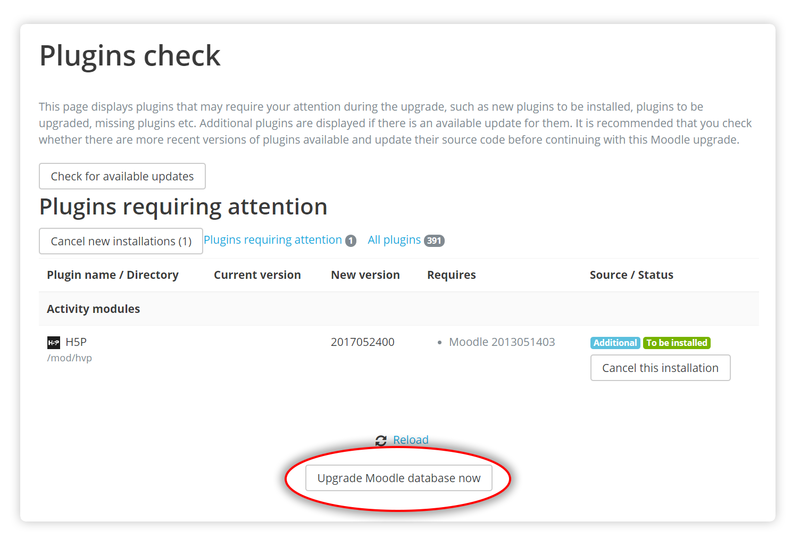 For further info and issue tracking, check out the h5p-moodle-plugin page on GitHub. 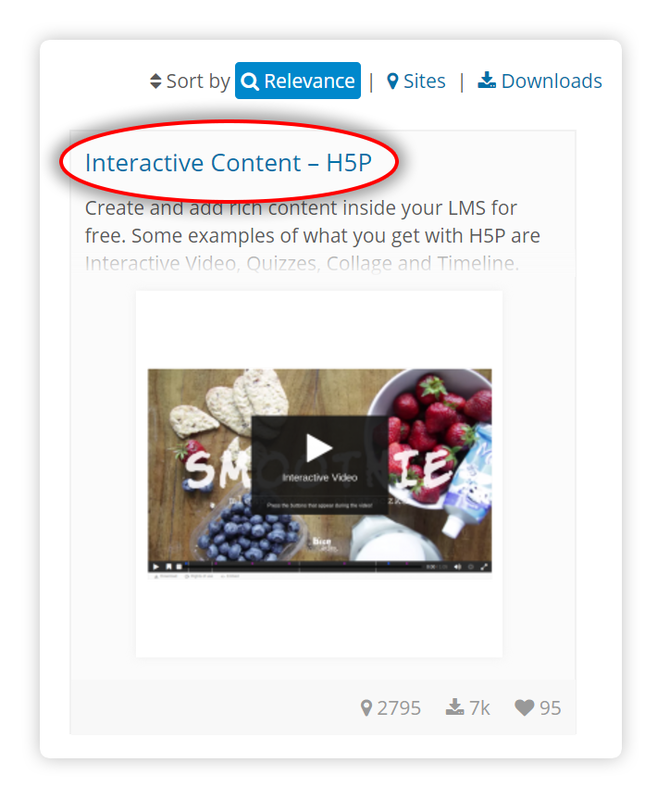 Enjoy making rich interactive content in your favourite LMS! 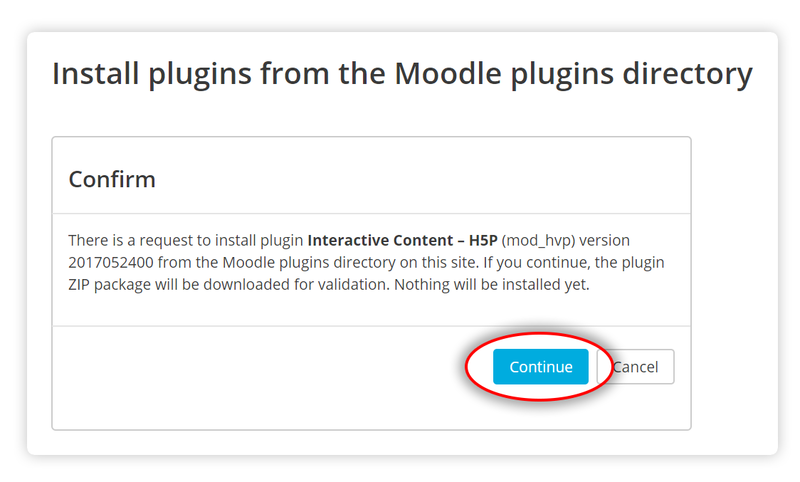 When can we expect H5P in Moodle? We are developing online learning in Moodle and would like to know when H5P will be available in Moodle. We haven't been able to secure the financing for the entire project yet, so I'm not sure. There will be a prototype of some of the features available on github in january, but we'll still be missing the authoring tool. How much would it cost to develop a plugin for Chamilo LMS? Hello Falcon, Chamilo is a very good LMS similar to Moodle, (www.chamilo.org) we use Chamilo in our elearning courses and be willing to finance the creation of a plugin for this platform. How much does a project like this could cost? If it is within our budget we´ll be happy to finance that. (Of course, every other major version of Chamilo will need some adjustments i guess, so this could be the begining of a long relationship) My email is direccion@isea.edu.gt. Ok, I'll be sending you an e-mail. we are using Stud.IP (an open source LMS) at our university and would like to integrate H5P - especially for interactive videos (quiz breaks etc. and analytics). If we were to finance the plugin, what would we be looking at? I am looking forward to further information (via email). I'm glad to hear that you consider sponsoring H5P development. Maybe you could reach out to my company, Joubel, on contact@joubel.com to discuss? Maybe you could also contact me/us at data-quest. We are programming all kinds of customized Stud.IP-plugins, and implementing H5P into Stud.IP would be such a plugin. just thought I'd check in to see if there has been any progress with the moodle plugin.. we are using it and embedding on our Moodle LMS at http://mybigcampus.in but are super excited to be using it as a plugin... please keep us updated!Great Work! Followed up in a separate thread. 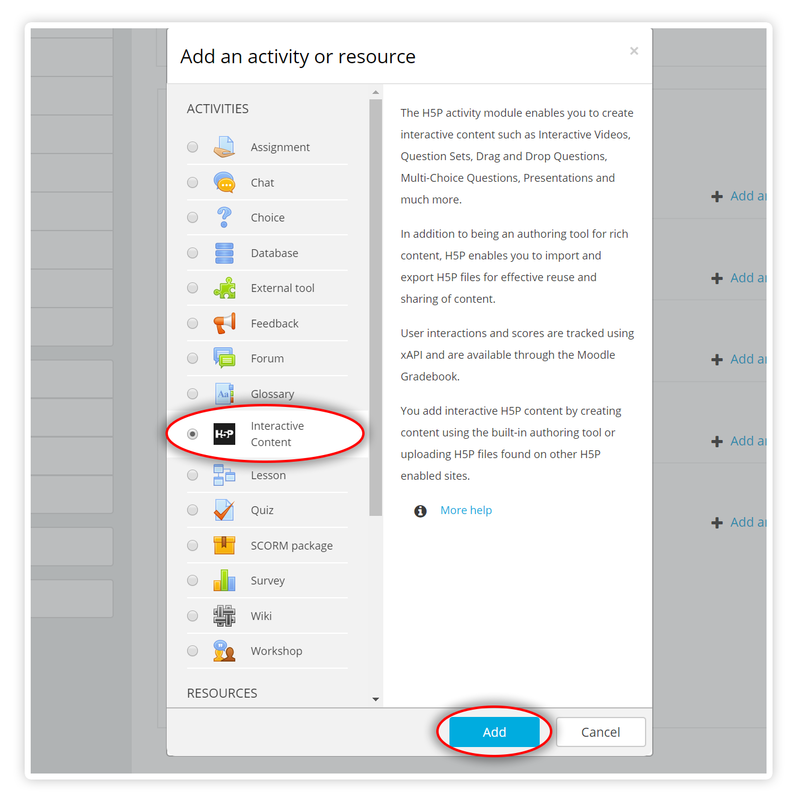 Are adding SCORM -features to h5p? People in the community have been talking about it, but I don't think anyone has done anything substantial yet. In Joubel we have no plans on working on Scorm in any way. We thing H5P + xAPI is a more future proof solution for e-learning and interactive content in general. I can't see option action create, upload interactive content. I am using moodle 3.0.4. I want to create interactive content. But i can't create. Unfortunately, the content editor isn't available for the test version so you may only upload H5Ps. This means that you'll have to create them on another site, download and then upload them to Moodle. The production ready version of the plugin will of course have the editor, and is scheduled to be released sometime in May/June, depending on how the testing goes. It's strongly encouraged to keep this option enabled. 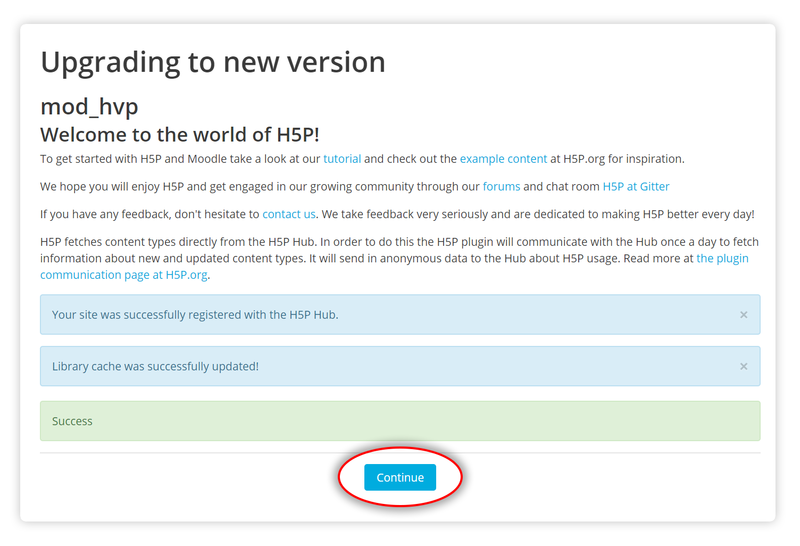 The H5P Hub provides an easy interface for getting new content types and keeping content content types up to date. In the future, it will also make it easier to share and reuse content. If this option is disabled you will have to install and update content types through file upload forms. Really excited for the Moodle production release - will an email be sent out once it's available? French version of H5P ? I 'm wondering if by any chance there would be any french version of the H5P tool ? Does the MOODLE platform keep track of the students results inside the H5P contents ? I've been able for video interaction activity to translate most of the interactions. But some like "ckeck", "show solutions" on buttons etc. can't be translated it seems (annoying in order to use H5P with young pupils who don't speak english). The parameter "modestbranding=1" allows me to keep my young students safely inside the LMS platform (Moodle). Nevertheless H5P stays a very exciting tool ! The button texts you mention should be possible to translate. I've seen them in Norwegian. I tried it now and I notice that we have an ugly bug related to this now. The fields for translating didn't show up right away. After playing the video in the authoring tool and opening the edit menu for one of the interactions the fields appeared under "settings and text". We will look into this. This is great, have been keeping an eye on this and am looking forward to using it with Moodle. I have been playing about with it a bit and it doesnt look like you can embed the content (like you can from trhe h5p website). Is this something that will become available so that you can create content in one place and use it in other areas of the platform? I'm glad you like it. Do you mean like embed(shortcode) into the other resources or parts of a course? The issue with having embed in Moodle is somewhat related to how Moodle is made. H5P is an activity and activities have to belong to courses(as far as I know). This means that the access to the H5P will depend upon the user and which courses he or she has access to. This means that a teacher may have access to a H5P in a certain course and then embed it somewhere else, where it will appear to work for the teacher, but the other users, e.g. students might not have access to the origin of the embed. Because of this it may proove difficult to know where you can embed stuff and who will gain access to it. A lot of the same goes for grades too. It may be difficult to know which course the result will be tracked in. A feature for teachers to easily clone H5Ps into different courses might be a better solution. Yes, I was thinking it would be really good to be able to use it in other resources, for example it would be nice to be able to have a lesson that does all the tracking for the students but in the html you could embed and use the HP5 content as an extra learning resource within other activities. I've had a quick look at the GitHub issue and it seems to be heading in the right direction, ill have a propper look at this. Switch the h5p filter on in your course and attach h5p as a file, for example in a moodle page? Any chance that you will develop a plug-in for Canvas LMS? As far as I know it isn't possible to develop plugins for Canvas. We will instead offer a service that you can sign up for and create content for your students via LTI. Rather than develop a separate plug in for all possible LMSes, working on a standard LTI-compliant system will allow all schools to use H5P with their LMS, which is a better end goal. I'm excited to see this happen! It's great to hear that people are positive towards LTI support! H5P for Moodle is also implemented as a filter, which means that where there is a WYSIWYG editor in Moodle, you and your students can embed H5P files. I think this is a great plugin. I have a question. How do I enable H5P as a filter? I do not see the h5p filter in the course administration. Could you elaborate on what you are trying to achieve ? Do you wish to filter on the H5Ps so that they are the only activities that are shown ? This can be done by selecting "interactive content" inside the "activities" block. If you wish to create a Moodle filter, you should check out the Moodle documentation for filters and filters development. I forgot that I had an unfinished - not working - H5P filter attempt on my test server. It was an unfinished clone of the Scratch filter I also use for other "players" like a version of the Simile timeline. I will try to get it working by looking at the call to the player in the Moodle module..
Another - maybe easier - approach is to implement it in the Genrico filter? If you wish to give students access to the H5P editing modus, you have to raise ther rights in the H5p module. that was created previously. I hope it makes sense. Thanks gtielemans. We want to use it as a filter, it will be great if it can appear in the editor. Do you have an idea on how to approach that with Generico plugin? I'll note down your request for the next version of the Moodle plugin. I guess it's safe to say that many people want a more flexible way to insert and use H5Ps inside Moodle. Would you have preferred a separate grade for each place you insert the H5P, no grade at all or just one 'shared' grade for the H5P no matter where it's inserted? I like very much the Moodle version of H5P, especially the possibility - for a teacher - to create h5p resources on the spot instead of using a separate resource server like h5p.org. If I want students to create their own h5p arfefacts now, I have to create as many instances of the h5p module as I have students and then assign each instance to one of the students. What they create is always visible for other students, unless I add extra Moodle complexity by create groups of one student in a gruop, choose grouping and group-members-only access. Very time-consuing extra work for the teacher. student-created artefact only visible for teacher? choose assignment and let students embed a h5p costruct. (preferred option) In the wysiwyg editor there is a new h5p button in the toolbar (create one for Atto and one for Tinymce editor?). When you put the cursor focus in the wysiwyg text and press the button you get the edit screen for a new h5p item, you can choose the type in the drop-down menu as in the module version and fill it. After closing the edit screen it will be visual embedded on that spot in the text. (and option 3 are less intuitive) You attach a file with extension .h5p the chain symbol (2) or with the attach a file option (3). when you switch back to view mode. The embedded file will be evaluated: if it is an elsewhere created file, it wiill everytime show the edit button for that h5p screen, untill you uncheck the new "display edit button" checkbox. If it is an empty .h5p file, it will open a new edit screen like in the module version. Because you use the h5p filter embedded in another Moodle activity, you use the student monitor/garding of that activity. I feel here no need for extra h5p evaluation mechanism as in the module, but maybe have other users different preferences. I use for timeline a clone of the scratch filter where students can attach an off-line contsructed - json string in their assignment or foum answer or... This string will be visible in the view mode and other students can download/iprove/attach to their own answers. Ah, thank you for the input! I'm not a 100% sure I'm following how you use Moodle. Do your students create 'clones' of your content you've created? It certainly looks like something that must be taken into account when improving how you can use H5P inside Moodle. All of your input is very valuable, so thank you for taking the time. It is nice to see that you support LMS, but what a pitty that only moodle is available. Indeed it would be nice to support more systems and hopefully, in the future, there will be plugins for the plugins you mention as well. Why was Moodle chosen first? I guess it was because people was out pretty early requesting H5P support for Moodle and it hasn't been hard to find people or organizations willing to contribute to the development. Moodle has quite an active and great community! A very simple filter in Moodle - and other systems - would see the extension of an embedded .h5p file. This .h5p file is created on a external system like h5p.org or with the Moodle h5p editor and then downloaded. The only thing this filter does is replacing the .h5p file with a player surrounding that .h5p file. Sounds very interesting, but my guess is that there will be some work involved getting it to work. Please checkout WIP code that can help you embed H5P inside other Moodle content. Would be great if the bigger active communties for Ilias and Chamillo could create plugins for their own LMS, because then we could start to exchange interactive .h5p files between all our systems!